The scarlet ibis is named for its distinctive red plumage. Males and females of the species can be distinguished by size; the male is larger and has a longer bill. 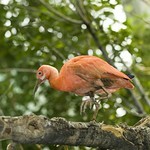 This wading bird can be found in Northern South America from Venezuela to Brazil. Common. 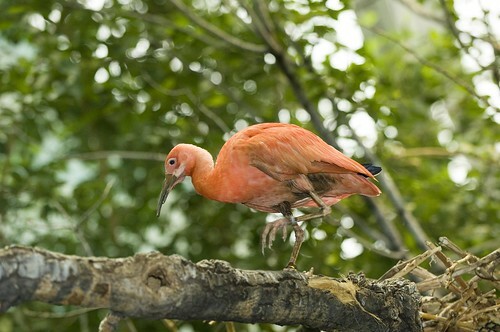 Lincoln Park Zoo participates in the Scarlet Ibis Species Survival Plan®, a shared management effort by zoos throughout the Association of Zoos and Aquariums. The scarlet ibis inhabits marshes, swamps, lakes and streams. The scarlet ibis uses its large beak to locate prey in the water. Crayfish, crabs, insects, frogs and fish all make up parts of the bird's diet. The scarlet ibis lives in large colonies that can include thousands of individual birds. This dense social structure helps the birds keep watch for predatory big cats and birds. Males of the species use elaborate preening, head rubbing and flight displays to attract females, and breeding pairs will even wrap their necks around one another to cement their courtship. The scarlet ibis' long, thin toes enable it to step easily through the water.